Some Americans have been looking forward to next week’s solar eclipse for months – or in extreme cases, years. But even those positioned to witness a total solar eclipse on Monday will see the moon completely cover the sun for, at most, about 2 minutes. Kind of a letdown, right? Actually, it’s perfect for today’s viewing audience, said Roberta Garner, a sociologist at DePaul University. “The great thing about the eclipse is that it fits our ever-shrinking attention span,” Garner said in a press release. For Garner, the widespread anticipation of Monday’s event is in part the result of a public that is more interested in science than ever, she said, with increased focus on science education, support for careers in the STEM fields of science, technology, engineering and math, and science-related controversies making headlines (think climate change). But the buzz leading up to the event – which marks the first total solar eclipse to cross the entire continental U.S. in 99 years – also represents a growing social trend, Garner said: the desire for shared experiences. Unlike in many developed countries, Americans’ views about issues like climate change are deeply divided, often along political lines, according to Pew Research Center. Reporting by the New York Times shows that about one-third of Americans surveyed said they discuss global warming at least occasionally with friends and family, while another 30 percent said they never do. Aug. 16: What can happen if you look at the sun for too long, even if it’s partially or almost fully blocked? 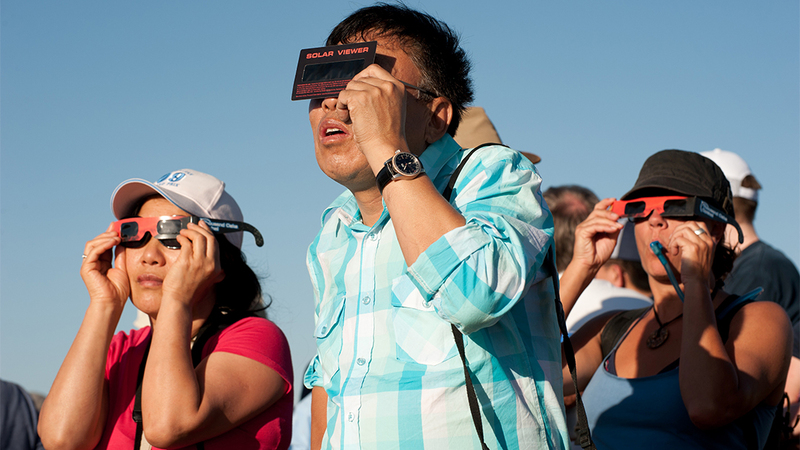 We speak to an ophthalmologist about how to safely watch the eclipse. Aug. 16: You don’t need to trek all the way to southern Illinois to revel in the solar event of the century. Here are 12 places in and around Chicago where you can celebrate the eclipse. Aug. 3: All you need to know to get ready for the coming total eclipse of the sun.